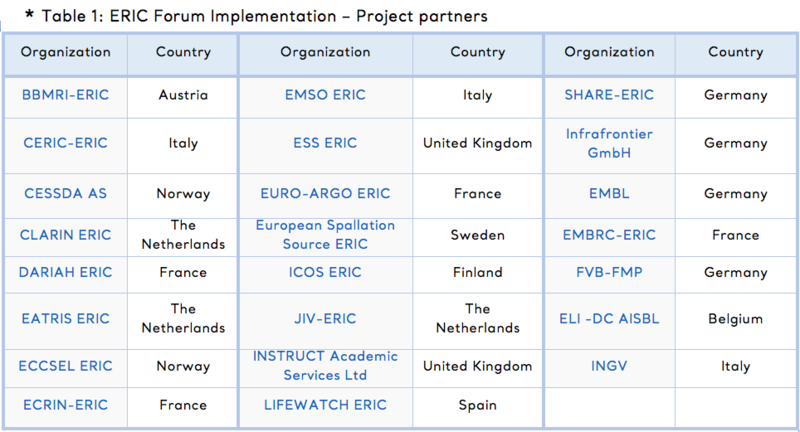 On January 31st, 2019, 23* European Research Infrastructures based in 11 different countries, and with nodes in all European Member States, met in Amsterdam to launch the ERIC Forum project, co-funded by the European Commission’s Horizon 2020 programme (grant agreement 823798.) The project will run until December 2022. In the past years, the EC and the ERICs (European Research Infrastructure Consortium) met twice a year to address and discuss issues related to the implementation of the ERIC regulation. ERICs exchanged questions and know-how on common challenges in fields spanning human resources management, procurement, VAT and excises exemption implementation, in-kind contributions, as well as the socio-economic impact of ERICs, performance monitoring and more. Aware of the constant enlargement of the community, the existing ERICs formed in 2017 the ERIC Forum, to further strengthen the coordination among ERICs, and between them and the EC, to achieve the full implementation of the ERIC regulation. One of the major outcomes of the project is to frame the necessary knowledge to support RIs interested to explore the ERIC legal framework and ERICs in preparation with various aspects. This includes the development of guidelines and best practices related to various fields, the creation of a repository for legal documents such as internal regulations and rules of procedures, etc., which will be publicly available through an online toolbox. Each of the 6 thematic work packages within the project will focus on a specific area. This includes: the overall coordination of processes within project (WP 1), the analysis and development of ERIC Forum’s governance model (WP 2), the development of guidelines and best practices related to ERICs’ operations, administration, HR and Finance (WP 3), the establishment of ERICs’ impact assessment methodologies for long-term sustainability (WP 4), strengthening the ERIC identity through targeted communication and dissemination activities (WP 5), the definition of the role of ERICs within the European research ecosystem and science policy (WP 6). The ERIC Forum has received funding from the European Union’s Horizon 2020 research and innovation programme under grant agreement n. 823798.